Dave Woods Mk Three Faber "Otter"
Build up, and trials reports. The picture above is of Dave riding his superb BSA C15T, that he had to sell to be able to build the Mk 3 Faber framed bike below. OK this is Dave Wood’s new Mk 3 Faber “Otter” build, and Dave has agreed to let us into following the build up of this new bike. Dave had a very successful BSA C15T that he rode with a lot of first class placing’s and trial wins. The bike was well sorted when he sold it last autumn to finance this new build This is what Dave has sent us so far, we will be following the bike has it is tested, then striped and assembled into the finished model .And we do so wish Dave every success with the New BSA “Otter” bike. Hi Charlie, here are some pictures of the first build of my Faber. At the moment it's just thrown together with bits I have lying around in order that I can get it up and running and assess how it rides in order to finalise things like footrest position, rear brake mechanism, suspension, chain run and tensioner etc. The intention is to ride it a few times to ensure that the motor is ok, rear wheel alignment is good, gearing is correct and that any brackets I've welded on don't break off... Once I am happy that everything is working as expected I can strip it and get it painted. Things like the mudguards and wheels have come straight out of the parts bin in the spares shed, the seat pan is just made up to cover the air filter and will be neatened up to take a cover. 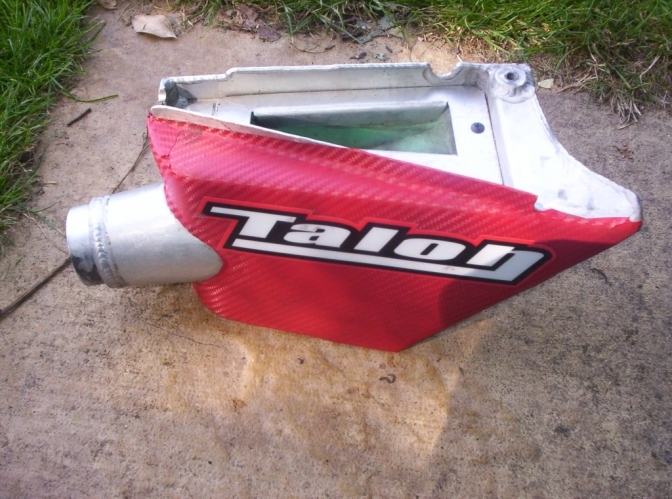 The tank is what I will use; it is a modified Ossa tank and will be painted. The wheels that I will use are the same type fitted now but rebuilt and polished. The rear is a Sherpa, front is Grimeca. 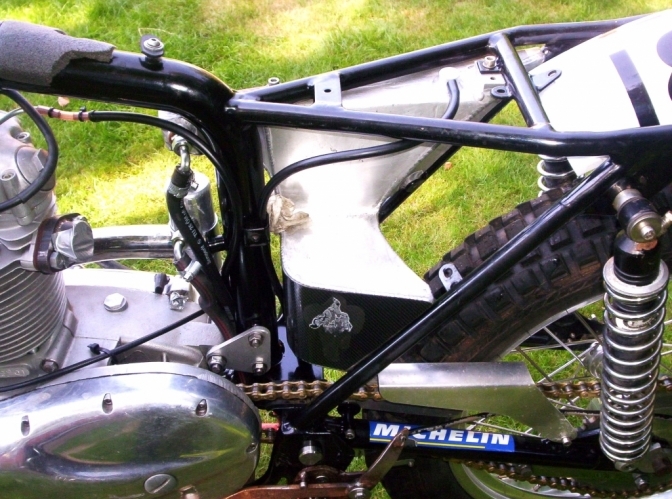 Forks or AJS bottoms with Marzocchi internals and yokes are the current billet type. Although the frame is Faber oil in frame, I prefer an oil tank, so that was made by a friend who is more than handy with a tig, and metal fabrication. The airbox is his too, and he modified a universal silencer to fit inside the frame. I use an oil filter from DC Classics. Sumpguard is from a Cota 348 and fitted almost straight on. The engine is what I can best describe as, a 'long stroke C15', which comes out to about 330 - 340cc. It's built by Pete Kirby, I don't know the spec but it is definitely all standard BSA parts apart from the cylinder and piston. I don't know what the piston is from but is shorter to deal with the longer stroke I guess. The cylinder is a new casting. It has a special top gear which makes a taller 4th for roadwork, as primarily I'm building it for the Manx Classic (hope I get in). Not interested in building it for Scotland, too much conformity, compromise, and expense, for one event I may not even get an entry for. Ignition by the way is PVL. [Charlie]. And Dave has just told me that the clutch fitted is one of them beauties from that man again, Pete Kirby. [Dave]The clutch is Pete’s; I forgot to mention that bit. He had used an experimental set up to get it as light as possible (it was unbelievably light, you wouldn't have thought it was attached) but that was the problem, it didn't bite hard enough, and would slip under load. I'm trying the revised set up tomorrow but it fires off the clutch in 3rd in the garden with no slip, so I guess it should be ok now. I know there is no problem with the actual clutch; it was just an attempt at a different set up. First ride a couple of weeks ago was an easy local club trial which was dry, so the only issue that showed was the footrest position was in the wrong place. Got home, out with the welder, and moved them forward ready for the BMCA trial the following day. That was very wet due to overnight rain and grip was at a premium. 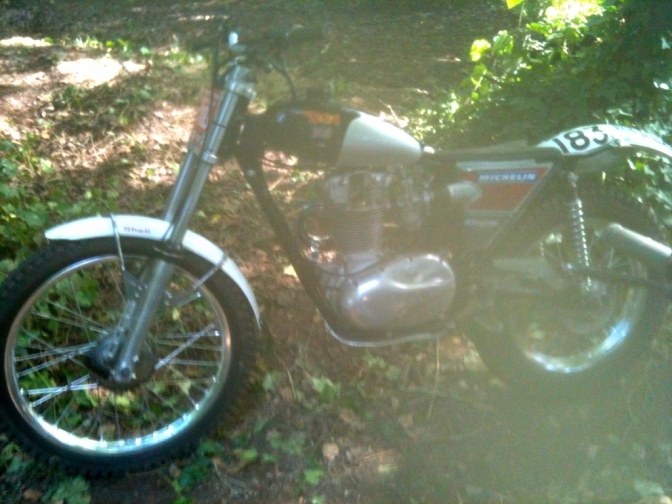 That trial revealed a badly slipping clutch, front suspension that was way too soft and leaking forks. The general feel though, with the footrests moved was good and the bike seems to handle well enough. These issues have been sorted hopefully but I'll know more after the next BMCA trial tomorrow. Some Other Pictures in the Gallery. Hi Charlie, following the last outing I have mainly been trying to get the forks to work in the way I want, as mentioned before they were woeful - too soft. Having messed with various springs, oil quantities and grades all last week, all to no avail, I finally cried enough and removed the complete stanchion assemblies and swapped them for another set of Marzocchis I have from a Fantic 200. Went to the BMCA trial yesterday and straight away it was apparent that the forks were again too soft so this issue has me stumped at the moment. Nothing I do stops them from bottoming or topping. A pair of Ossa forks are going on next as a control experiment as I know 100% that they work. The trial also showed the rear dampers to be too soft as well but as they have just been nicked from another bike with different geometry that's not unexpected, but I can live with those for a while. The clutch is now fine and working as expected with no issues at all. I'm still undecided on the footrest position so may alter it again for the next outing but overall the bike feels pretty good. The motor is very strong and pulls like a train. It's maybe a little bit punchier than I'd prefer off the pilot jet, but that could be down to it being brand new, and it may lose that 'edge' in time. Also, the gearing is possibly a little too high, a couple of teeth added on the back may also help with throttle take up in tight stuff. As good as the clutch is I prefer riding without it. So, after only 3 rides, things are progressing well apart from the front forks issue. 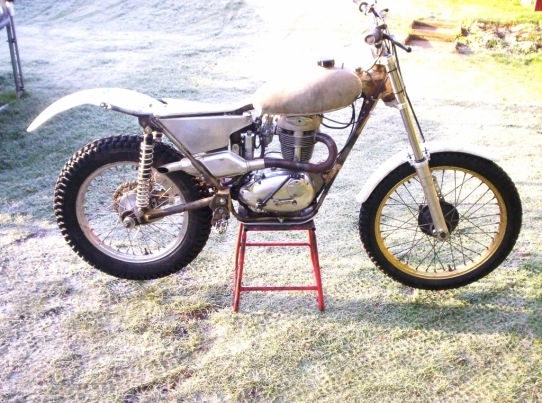 I'm not sure when I'll next get out on it as the first round of the ACU Normandale series is looming and I have to get the Bultaco sorted for that as it needs a couple of jobs doing. So I'll be riding that for the next couple of weeks starting with the Aqueduct Classic trial next week. However, if I get time to do the jobs on the BSA as well, I'll take it along to try after the trial. If so, I'll let you know. 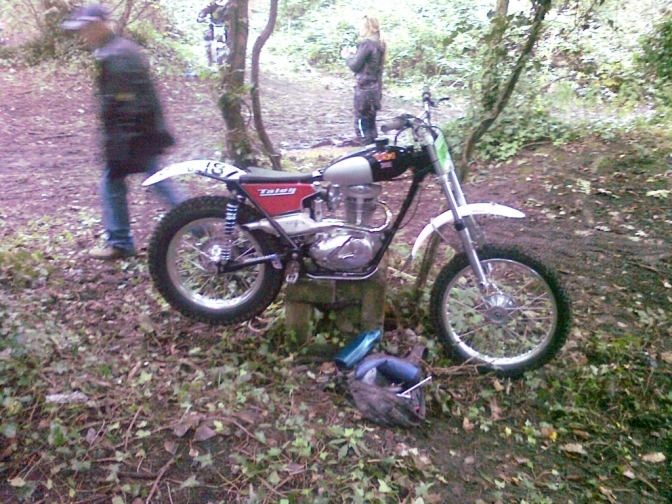 Here is a shot of Dave's bike on the first set of sections in the Manx Classic trial 2012. Dave had just been thrown from his steed, with a jamming front brake, and had removed it to sort the problem, and although when I saw him later in the trial he still had the same thing happening, he went on to win a first class award, and would have be up the front if not for the wheel problem. Nice ride mate and what a class bike you have built. 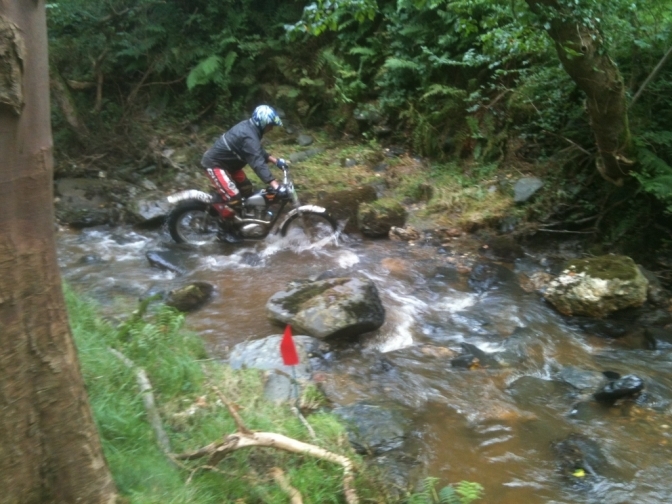 And a shot of Dave in the mountain stream, near Sulby IOM. Here is Dave's update, fairies from the bridge working again hey Dave? Hi Charlie, thought I'd send you an update of progress so far. Progress has been very slow since last time with the issues identified back in January taking an age to address, but as you know, I got the bike to the Manx Classic which was its first trial since I cobbled it together for the initial 'shakedown' BMCA events back in January... Still some issued to sort, but on the whole the bike performed pretty well and finished the trial without (too much) drama. Back to January and the main issues were a badly slipping clutch and front suspension that was way too soft. The clutch was an easy fix for Pete Kirby as we had tried a soft set up on his diaphragm set up but too soft, so a simple adjustment sorted that out. Things then moved slowly for one reason or another. I'd caused a problem with oil feed when the gasket moved on the oil pipe union under the engine and the momentary starvation until I realised what had happened caused something to pick up in the engine, so it had to go back to Pete for a strip down and check over. I had to get swingarm bushes made, the swingarm must have distorted during manufacture as the original silent block things supplied wouldn't fit and were just peeling metal up inside the tube when pressing them in. A lot of agro to sort and still not sorted properly as I have a temporary needle roller set up in at the moment. 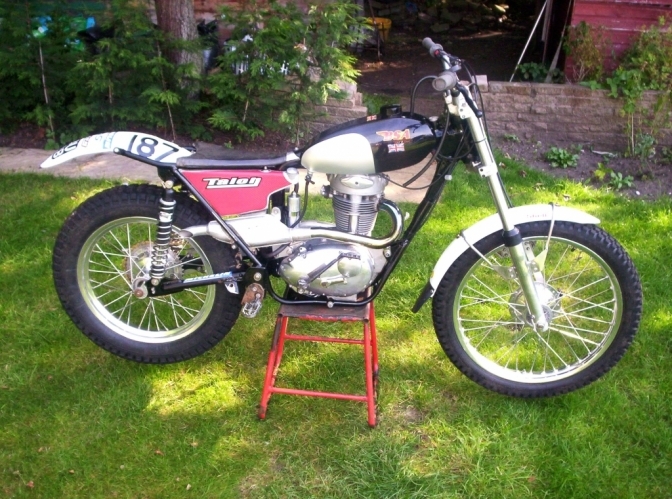 There still isn't much clearance around the chain run and trying to make room for the wheel (Bultaco, so I can swop around with my Bulataco when needs be) alignment, chain guard, tensioner, brake rod and shock absorber proved a nightmare, but got there in the end. I had to space the shock out by about 10mm and countersink the sprocket bolts to clear the inside of the swingarm. The front suspension was more problematic and no matter what I did, the forks just collapsed. The forks were AJS sliders with Marzocchi stanchions. I tried three or four different sets of internals and springs but nothing improved it. It seemed there was too much weight on the front and the bike does feel 'nose heavy'. I was running parallel yokes from one of Jim Pickering's mates, Alex and this seemed to put extra weight on the front wheel. I decided to try yokes with some rake built in instead of parallel to see if moving the front wheel forward took some weight off it. Back home and two weeks to the Manx classic with the bike not ready... The steering was awful with the current set up. Back in the shed and found some Marzocchi yokes, bottom yoke of a 303 Fantic, top yoke off a JCM. More time in the shed making sleeves, spacers etc. and in with the yokes, still with the Ossa forks. Four days to go to the Manx and back out to try the bike. Better, the steering felt much better and not so heavy on the front as the shorter offset and bar position of the top yoke made me more upright and shifted a bit of weight off the front. Back home for a final fettle. Noticed the rear wheel bearings had play. Took the wheel out to replace them and the drive side bearing just fell out. The housing had worn during the last two rides and the play was the bearing moving around, not a worn bearing. The hub will have to be machined to repair it, no way to get it done before the trial, but this is the benefit of sharing components with another bike, I was able to take the wheel out of my Bultaco and use that. The trial itself highlighted a few more issues. The front brake is erratic and downright dangerous at times, alternating between no feel or stopping ability to a grabbing action that sounds like a pistol shot when it comes on and locks the wheel in an instant. Two occurrences of this on day 1 cost me a 5 (and a trip over the bars) and a 3 (nearly a trip over the bars) and a big lock up at a junction on the road. On day 2 it locked up on a steep descent down to the next group of sections which caused me to slide off a ledge and into a bog (on a steep slope) which put me over the bars and entertained anyone watching. The bike landed perfectly, upside down, just as we used to put our pushbikes to remove wheels when fixing punctures. Pete Kirby had a look at the set up and gave me some pointers as to what could be causing the problem, so at least I have a direction there. Other issues are the exhaust, rear shocks, rear brake set up and maybe footrest position. I'm not sure that the exhaust is too restrictive so a change will be tried here to give more flow and/or volume. The rear shocks are too soft (again, nicked off my Ossa as a starting point) the rear brake pedal/set-up is still 'in development' and I may move the footrests back a little. The oil tank and air box may be too close to each other as there appears to have been some rubbing under vibration which has caused a small hairline split in the tank which now requires repairing. I'm wondering about using the oil in frame and having a bigger silencer to fill the gap where the oil tank sits for a larger exhaust. The swingarm bearings/bushes nee a final solution, the sidestand needs redoing along with one or two minor things. All this will take a bit of time, so it will be a while before it is out again I guess. I'll keep you posted. In the meantime, I've attached some pictures of the bike now it has some paint on it from yesterday's clean up following the Manx, also showing the oil tank and airbox which are works of art by a clever mate of mine. Dont you just love the shape of this "Otter"? I Like the tank covers too. The time that has gone into this air box, and the oil tank, to get them to this standard is incredible. Thanks Dave, I am sure you will get an entry for next years Manx Classic trial, and if the bike is right by then, I know you have a very good chance to win! But dont tell Juan that!!! Well Charlie, it's been a while and another Manx has been and gone since my last update. 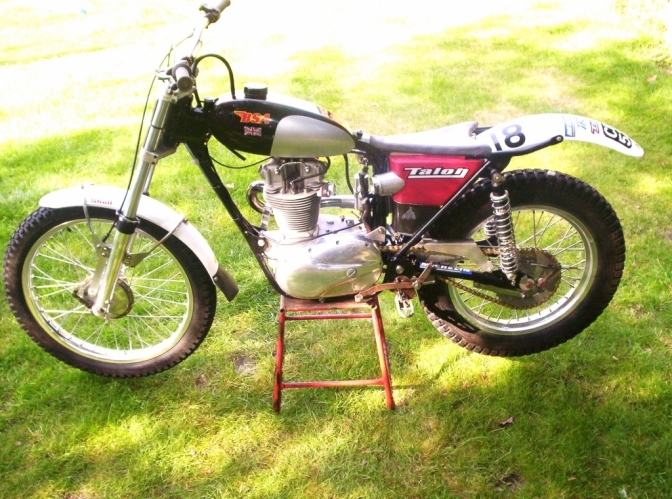 Fact is, after the 2012 Manx, I didn't have much time to do any more work to the bike as the types of trials I was riding in afterwards needed the Bultaco, so I rode it a couple of times, which meant I didn't get to address any of the issues. All I managed to sort out in the time immediately after the Manx was the erratic front brake following some pointers to probable causes by Pete Kirby. Pete suggested the angle of the torque arm wasn't ideal, neither was the material it was made from. Both may (probably were) have been causing flex in the arm. I'd made the torque arm myself from what I thought was pretty solid / rigid alloy but Pete gave me that knowing look that said no it isn't... The benefit of being an engineer as opposed to a pen pusher... I also found that when I removed the arm, the locating hole on the hub end had ovalled causing unwanted movement, which wasn't helping either. So a new, proper, torque arm was fitted and spaced so that it was straight and not angled. Problem solved. 2012 passed, we were into 2013 and still no work to address the remaining problems. I still wasn't happy with the steering, still thought the exhaust was restrictive and still wasn't sure of the riding position. The performance of the engine off idle wasn't right either and I wasn't sure if this was carburation, a duff carburettor or an affect of the exhaust. Or maybe an erratic ignition.... It was inconsistent in its pick up off idle. Sometimes it would come in cleanly, others it would come in with a bang which, if negotiating a tight turn, would push the front. Not good. FIrst thing to try was a carburettor. I tried a Dellorto from Chris Denney's B25 engined bike. It seemed to improve the pick up so I bought one and had a couple of rides in local trials to try it. I still wasn't convinced and wasn't able to get it how I wanted no matter how I altered its set up. Back on went the Amal... At the same time I'd finished making an experimental silencer set up which I fitted and tried around the garden. This replaced the single silencer that located behind the frame upright with two silencers. I felt the original silencer that had been scalloped to fit behind the frame was restrictive due to reduced volume due to the scalloping. 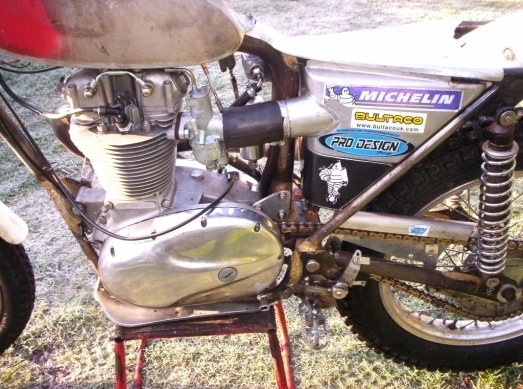 So I fitted a silencer with straight through perforated tube and wadding that sits in front of the frame upright above the clutch arm, then a link pipe up to the top shock mounting that fed into a Terry Weedy universal silencer under the mudguard. This improved things and it felt better - I was convinced. It was also quieter, which was another objective. Took the bike out for a try and rode a couple of events. It was better but still not as I wanted and the uncertainty of what it was going to do when coming off idle was still there. For someone who prefers to ride just on the throttle, no clutch, this wasn't good. Worse was to come. On a subsequent "try out" ride the piston became quite noisy and I think it had suffered a mild seizure. This all stems back to my initial start up when building the bike when I starved it of oil. Long term damage. Anyway, it needed attention so off to Pete it went for a new piston. With that problem sorted and after some careful running in, it was back to the drawing board to try and solve the erratic pick up from idle. Not much progress was being made and the 2013 Manx was getting close, just a few weeks away. I was still not entirely happy with the riding position of the feel from the steering either. Still no progress with anything and the Manx was now just over a week away. The weekend prior, I took the bike to one of our local practise grounds which was bone dry. This allowed me to try all of the sections I have that are on banks with plenty of cambered uphill turns. I just couldn't make any of them as the front wouldn't hold. It just pushed out everywhere and needed a foot down to pull it back on line. I rode the same sections on half a dozen other bikes and had no problem. They are sections I can clean easily on my Bultacos as well. I tried my bike again but just couldn't do them. Hacked off doesn't begin to describe it as it was now the Saturday before the Manx. Sunday morning I went into the shed and pulled the bike out. Up onto a stand and a good look. It had to be the riding position that was putting me too far back on the bike. The bike was also tall. I t needed to be lower. Out came the grinder.... The footrests were moved up and forward, about an inch in both directions. This needed a new brake pedal and mount as well. The rear shocks were shortened to drop the rear about 15mm. The front forks which were Ossa, has been fitted with Marzocchi stanchions into the Ossa sliders a few months earlier as I thought the front was a little low. Now, to lower the bike overall, I fitted the original Ossa stanchions back in which are about 1.5 inches shorter. I also fitted some Alan Whitton yokes to replace the Marzocchi yokes. These had 1.5 degree angle, not parallel, but less offset than the Marzocchi yokes. I know it's wise to make only one change at a time but I was out of time for that. The changes were all calculated, but still a calculated gamble. The bike now sat lower and the riding position put a little more weight over the front and me more upright instead of stretching for the bars. This took me until Tuesday to finish. 3 days left. Wednesday and I headed back to the practise ground and with more than just slight apprehension. made my way to the first section. Cleaned it easy. Moved on to the next and the same result. Cleaned them all. As conditions were exactly the same as they had been the previous week, it was a relief to know that the multiple changes had worked and the front no longer pushed out but held the ground better. Manx here we come. Although I hadn't managed to cure the erratic throttle response off idle, I wasn't too concerned as the more open nature of Manx sections meant it shouldn't be an issue. Hiding in the Manx shadows, at section One,Manx Classic Trial. And so the trial. Four sections ridden with no problems, the bike going well, still clean and off down the road to the next, third group. Then - Disaster. As you know that was the end of the trial for me as the exhaust valve picked up and siezed solid in its guide. Another legacy of me starving of oil on that initial start up. Huge disappointment but it wasn't repairable so that was that. I did manage to get a lift back to the start and finish the day on Steve Thompson's Ariel but some groups had closed when I got to them, I was so far behind, so any chance of a result was gone. Back home and Pete Kirby sorted the engine but it was another two months of Bultaco trials in October / November, so the BSA was parked up again. I did fit in one trial which was the BMCA anniversary trial. This was held on land that was bone dry and the sections were tight turns. This once again highlighted the problem of the erratic response off idle and I was struggling with the tight turns. Prior to the trial I'd been talkng to Pete about this issue and he mentioned he had fitted one of the new Premier Amal concentrics to his bike and felt it was an improvement. I was convinced that my issue was mainly due to s duff carb so I ordered one. 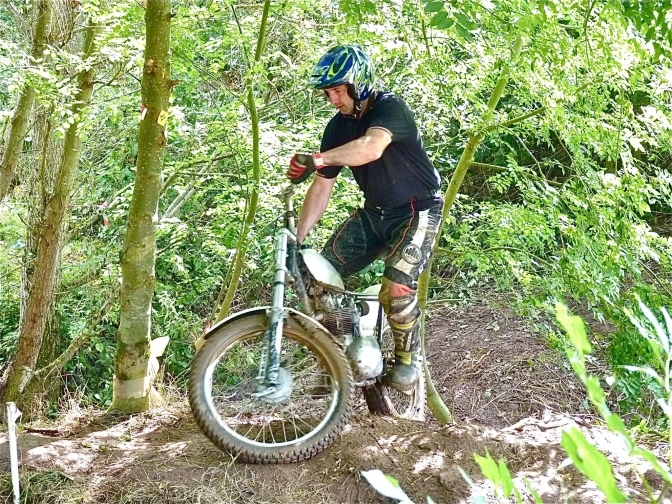 I rode the trial with the existing carb, then fitted the Premier and went and rode another lap of the trial. What a difference. It smoothed the response from idle right out and the bike coped with the tight turns with ease, now I was confident of how it would respond. One tweak to fit a smaller pilot jet and that was it. The carburation is much better and the mid range and top end is better too. This engine really does pull like a train and if I want 3rd gear it will pull it easily. Standing starts up steep banks with no run up are no problem. It finds grip well too. So that's where I am at the moment. The bike turns better, the engine is magnificent in its torque and pulling power and It grips well. The riding position I'm still not sure about and the front of the bike still feels heavy. I had a go on Steve Thompson's Mick Mills framed bike last week and that definitely feels lighter on the front end and also to steer. Doesn't grip like mine though... I think I'll put some risers under the bar clamps, just to lift me up a little and see what difference, if any, it makes. Starting with 5mm, then 10mm etc. I need to get the front forks working a little better as the springs are probably a little weak considering the (apparent) front weight bias. Also, I need to sort some rear dampers as they are still from my Ossa and again, not the right rating for the bike, although they work reasonably well so will do for the time being. I need to get the exhaust tidied up as I still have my experimental 'lash-up' fitted and I want to split open the Weedy silencer, remove the internals and replace with perforated tube / wadding. A tidy up of control cables is needed as well as getting some proper ones fitted. All this will take place over the next two or three months by which time I'll know if I've got an entry for this year's Manx or not. Hopefully yes, and equally hopefully, the bike will be in a better state than it has been the last two years and I can put a decent ride together. I'll let you know in a couple of months or so how things are progressing - or not..
Dave Wood’s Mk 3 “Otter” 2014 update. Well, the BSA hasn't received much attention at all since the Manx, I got a bit disenchanted with it after more bad luck in the trial. As you know the teeth stripped off the drive belt after only 4 sections on Saturday. Luckily I got back to the start and Pete was still there and had a spare belt, so was away again after fitting that. A little on the back foot time-wise because of that ,but made it to the finish in time and didn't have too bad a ride. Sunday, the chain stretched badly and came off in one of the easy sections that everyone was cleaning, then not too long after, the kick-start shaft sheared, so I lost my head a bit after that and another year went by with a worse result than I should have had. I'm still not happy with the feel of the bike as it feels too heavy on the front end and the steering it self feels heavy. I had Steve Thompson's Mills frame bike here recently and did some measuring, as his feels lighter on the front than mine. Most of the dimensions were very close, fork angle, weight bias, etc. but what was noticeable is that the engine (clutch case) is set right back against the swing-arm pivot on the Mills frame, whereas there is a gap of 1" between pivot and rear of clutch case on mine. My swing-arm is also longer. Moving the engine back on mine is a major job and beyond me, so I was thinking of a shorter swing-arm. However, looking yesterday, there is actually room to move the rear wheel forward by 1.5" at least in the existing slots, a bit more if I extend them, so this is the next job, which is the same as fitting a shorter swing-arm. Something else I have been struggling with is to get the engine pick up from pilot exactly as I want it. It's close but not quite there as sometimes it comes in predictably, others it seems a bit harsh or sudden. In a tight turn in a section when I'm coming off a closed throttle, this means I never know exactly how it's going to react, as if it surges it can push the front which can cause marks to be lost. Even if it comes in as I want, I'm still anticipating that it might not, which doesn't help... I've tried the Premier carb ,which improved matters but I've since bought the alternate needle and another pilot, but not had chance to try them yet. I'm also wondering about the ignition as it is a PVL but who knows what CDI or curve it has... I've just bought a timing gun as I've no idea where it's timed at. I managed to weld up the kickstart shaft to hold long enough to get it started and the timing gun showed it was firing at TDC... Unfortunately it then stalled and when I tried to restart it the shaft broke again and now won't hold with more welding. It's a Kawasaki splined shaft welded to the BSA quadrant so that the neater and smaller Kawasaki kickstart can be used, but it's the actual splined section that's sheared off, not where it's welded. It's probably too weak as it centre drilled and tapped with a centre bolt and washer to retain the kicker. Pete has acquired another but a later one which retains the kicker with an external nut onto the end of the shaft, rather than the end of the shaft being drilled and tapped. Probably doesn't matter with a little KDX Kawasaki but with my size 12 plates and a big 4-stroke single, it probably showed up a weakness in the shaft that wouldn't otherwise be a problem on its intended engine. Then I'll try out the new jet and needle for the carb and depending on what we find with the behaviour of the CDI from the timing gun, it may be necessary to look and see whether a more suitable advance curve is needed for throttle response from idle. So that's where I am at the moment, the bike has been in solitary at the back of the shed for long enough, time to get back on it again - the Manx isn't too far off.. I think it is time you got the "Otter" out of the back of the shed now Dave. It is to good a bike to be living there. update shortly with a good story.